Anton Bruckner, a devout Catholic, played a great role in the history of sacred music in the 19th century, a genre whose revival he tried to assure by founding his religious works on a traditional basis and taking his inspiration notable from the Viennese classical composers, particularly Haydn and Schubert. He went so far as to quote entire themes by these composers in his Missa Solemnis in B flat minor, completed in August 1854, which shows an evident taste for fugal writing and the dramatic use of chromaticism. Bruckner set several psalm-texts to music of a profound and moving spirituality. Psalm 112, written in 1863, was rediscovered only at the beginning of the 20th century, whilst the Psalm 150, his last piece of religious music, was composed 1892, four years before his death. It is a dynamic, jubilant piece with strong contrasts, based on themes deriving from plainchant, showing Bruckner's interest in early polyphony and Gregorian chant. 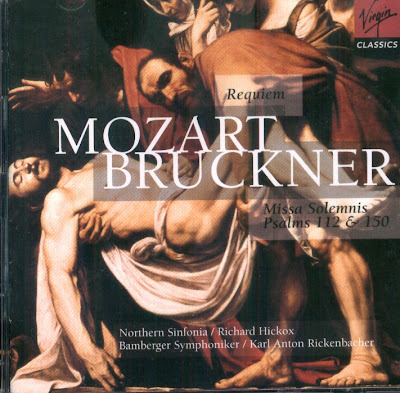 The 2 CD set was released by Virgin Classics, 1991, (DDD). Virgin Classics 724356150126.